There aren’t even 24 hours left before Samsung’s official announcement of the Samsung Galaxy Note7 which is to take place tomorrow at 10AM EST time zone. 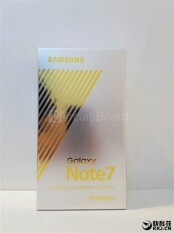 There are already leaked photos of the retail packaging and the Gold Galaxy Note7 in question. This leak thankfully isn’t a blurry photo of the phone in question. There are also photos of the actual device from inside the retail packaging. 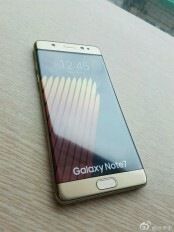 The Samsung Galaxy Note 7 is seen in all it’s dual-edged Glory as well. 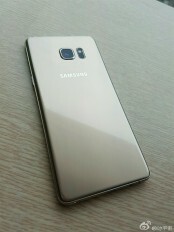 The device itself is pictured and it looks a lot like the Samsung Galaxy S7 edge but larger and perhaps a little “boxier”. The Note7 will be announced tomorrow with pre-orders to open either the 2nd or 3rd of the month. There were also rumors that pointed to an August 16 launch in Europe. Good news for Note 4 owners who have been awaiting a Note successor to launch since the Note 5’s release was altered for the European market and instead made the S6 edge+ available in the region in its place.